Our values are at the heart of our approach and reflect the working ethos of our team of experienced facilitators. We use video as a tool to mobilise groups and individuals to explore the issues that bring them together. The camera acts as a shared lens through which to look at the world and gives permission for the group to ask questions of each other and the wider community, that they might otherwise feel embarrassed or inhibited to ask. Our approach builds confidence and develops skills. Project participants produce a finished film of quality and experience the satisfaction of seeing a creative project through from start to finish. Amy and Rose, founders and directors of Living Lens, have known each other for many years. It was quite by chance that we discovered we had a shared passion in participatory approaches to change. Through our work in development (Amy) and human rights (Rose) we saw how problems arose and persisted due to breakdowns in communication. Using video as a tool to build communication, we found participants were able to go beyond the ‘them’ and ‘us’ mentality that had them stuck in the problem. 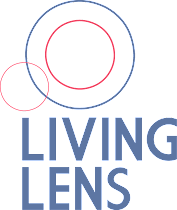 Living Lens started off with local projects and now run national and international projects. We have a radical approach to facilitation that allows us to love the challenge of working with people who believe change isn’t possible.